As most of you know, life gets ahead of us. We do things we say we are going to and then next thing we know it’s two months later and you’re not sure how it’s almost Christmas! That is where I am today, trying to figure out how time has flown by SO fast. I was going to write this blog giving you all the recipes that we have been creating throughout the past weeks and pretend like everything was going exactly as planned, but that’;s not the truth and that’s not life. The whole point of our new Instagram account (@absolutelyclean_) is to emphasize the fact that we UNDERSTAND that you are probably running around with your head cut off. We UNDERSTAND that you don’t have time to cook a gourmet meal or make sure that your kids have the perfect lunch for school. 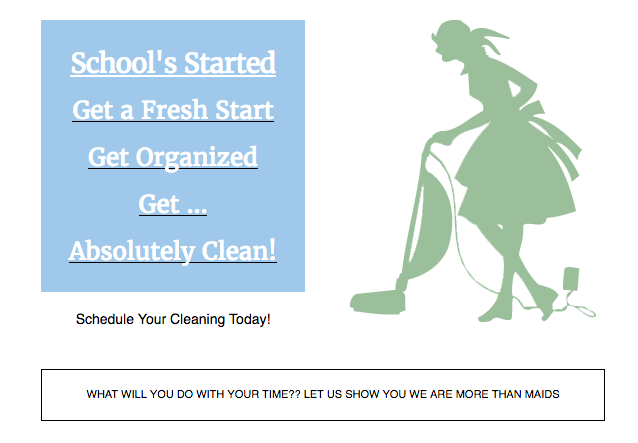 Most importantly, we UNDERSTAND that you don’t have time to clean your house. Honestly, you shouldn’t be wasting your time doing that anyway! We are professionals, after all, let us handle it. Here is what I HAVE learned from running this Instagram account, setting aside a Sunday to do Absolutely Time To Cook has proven to be the biggest stress reliever. Yes, it isn’t always prepping our meals for the week, in fact, most of the time we find the fanciest meal we can on Tasty and run with it. But its fun! Its genuine fun! When we first started sharing the meals we cooked each Sunday the aim was to show how meal prepping can make the rest of the week SO much easier. Which don’t get me wrong it definitely does make things easier and it is worth it but I’ve found something better. What has made my weeks even better than that is spending time with my friends and making meals that taste better each and every week. Sometimes, it is easy for us to forget that the most important thing is making time with your friends and family. We are all in a hurry to get to the next thing and to figure out what we can do to save even more time throughout the week. Having a time where you HAVE to sit down and have conversations with friends and eat delicious meals has honestly made me feel better than any meal prepping could. So, this Sunday I ask you to do the same! 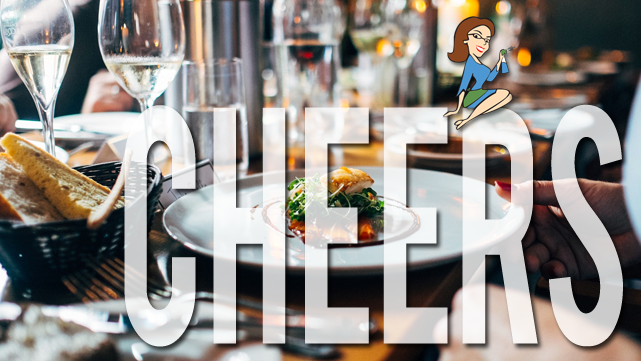 Go out to a nice meal or find a recipe online that you have never made before! Don’t let it stress you out, make it a fun night and don’t forget to drink some wine while you do it too ;). Tag us on Instagram of the meal you are eating and be entered for a chance to win a free clean! 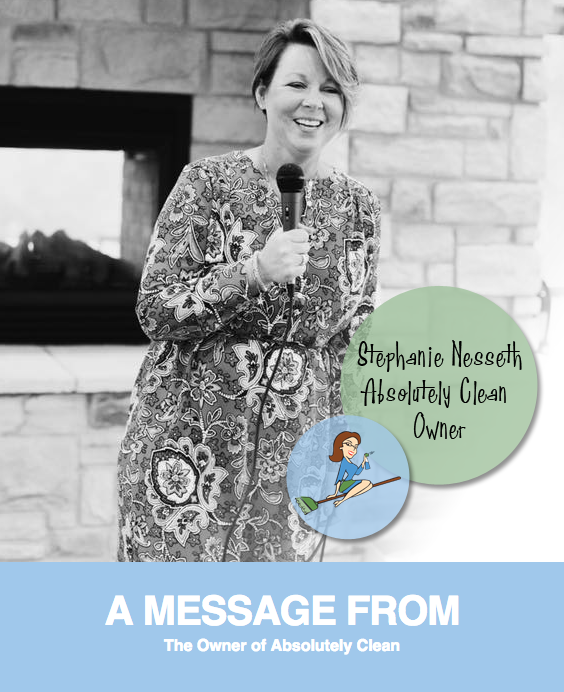 Listen to the Special Message From Absolutely Clean Owner Stephanie Nesseth Below. We want to give you the best customer service possible. Learn how we are working on quality. Thank You to CBS2/FOX28 and Kelly D’Ambrosio for the opportunity! 2017 – what . a . year!! It has been a true empty nest for me. 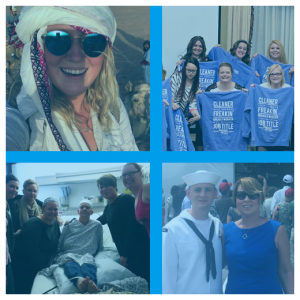 Our social media peep aka my daughter Grace – has been away at a Semester at Sea … traveling the world on a ship while earning 13 intense credit hours in between ports. Hawaii, India, Ghana, Vietnam, China, Japan, South Africa, Germany and many countries in between .. she’s now in Poland backpacking through Europe. My husband and I will meet her in Italy in less than two weeks. I am so excited to see the woman she has become. There is nothing more empowering than traveling and expanding your mind with our peoples cultures. Our differences bring us together when we let it. What have I learned this year with all adult children finally and completely out of the nest? 1.This mamma bear needs her cleaning service more than ever! ONE of the perks of children leaving the nest is the time we now have to devote to our own passions. I tell mama’s all the time .. don’t get so lost in your children that you forget who YOU are. We need to take care of our selves as well as our families. 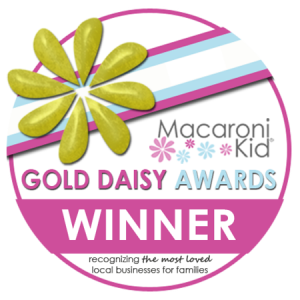 I’m thrilled that our service allows other’s to have the same flexibility that I built for myself.. working around our kids schedules while still providing. IT has been a dream come true. My other two children are on opposite sides of the US. I have one in Oregon and one in Virginia. We are able to visit them as well as my family in Nebraska. It’s crazy how much MORE time I have yet I have devoted all of my energy to everything BUT exercise. I used to be a runner… i’m struggling to walk around the block! Who has that secret??? 17 of those years has been as an owner of this company … it was designed for family. MY family .. and has been an extension for the same for others. My staff are my #1 clients and it’s THAT aspect that allows us to bring some amazing people into our lives to take care of our homes. I’ve had the opportunity to begin public speaking and I love sharing my story and inspiring others. 6. My staff are more than .. well .. staff. This is my second family so it hurts when some leave us and it’s joyful when we welcome new staff in. We lost Kristine to cancer this year and it’s left a hole for me as I devoted a lot of time to helping her. I’ve switched that energy to our non profit .. and our mission to clean for more families who have cancer for free. I’ll be presenting an opportunity for our clients and friends to help us with this mission this year in her memory. She is the 2017 Ambassador of Time In a Bottle this year . so stay tuned.. for little bits and pieces into the heart that is behind Absolutely Clean. We can’t do it without ALL of you. Tomorrow our company officially wraps up 2015. We do this with our annual employee appreciation dinner. Awards are given , times are celebrated. Your generous gifts at Christmas are drawn for and there is so much excitement that surrounds that. We thank you for an amazing year. It was our best yet and we are striving for an even better one. 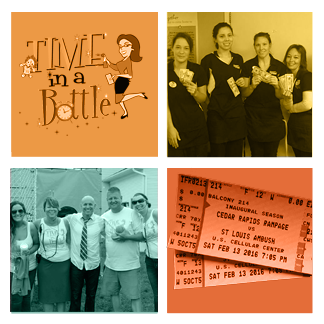 This year we were able to help more clients through Time In a Bottle and our client list almost doubled. Our staff was the MOST consistent it has been in years. This tells us we are doing a better job with our hires and we work hard here.. It’s a tough job market and we are PICKY. As I say that, we also have a couple out on medical leave. Mandy is having surgery today on both hands due to diabetes complications and Kristine begins Chemo next week for the fight of her life. We ask for your prayers. We also ask for your continued patience as we aim to give you the consistency you have been lacking as we transition new staff and rearrange teams for our staff that are on leave. We also have many that are being promoted with our growth! Such an exciting time. This isn’t a career choice for many, for some .. Yes. I find the mind and body typically handles this job for about one year if they truly are not a lover of all things clean. If it’s in their nature? We are the company to work for! We have many that are at a year and as always, we are preparing for our future and for your continued Absolutely Clean home. Molly will be transitioning to our Quality Assurance manager. Her job will be to make sure our staff are all trained to give you the same clean, each and every time. Communication is key here for all of us. Thank you for the feedback you give us. We try hard to make sure we listen and follow through. Molly has been with us for 3 years. Toni will be partnering with Molly from the office side. She communicates with our teams and dispatches them daily. She also visits with you, our client and makes sure our teams are up to date on your desires. She’s a great addition to our teams. Julie is transitioning to solely handling our admin… Accounts payable, receive able and payroll! She also handles our new client acquisitions and making sure our team managers are working to achieve a rock star day. You won’t feel much difference here, this is mostly an internal change. Elaine is back with us and we are very pleased. She is transitioning to our commercial supervisor and helps during the day with our residential teams as we make the adjustment.